Korean lifestyle innovator Kolon Group ushered in the beginning of a new era with the opening of the stunning “One & Only Tower” in April of this year. With a passion of bringing change to the lives of customers since 1954, Kolon continues to stand by its customers and strives to bring technological excellence to the world. After many years of success, the company brought on the multi-disciplinary team at SL+A Seoul to spearhead their move to the Magok neighborhood. 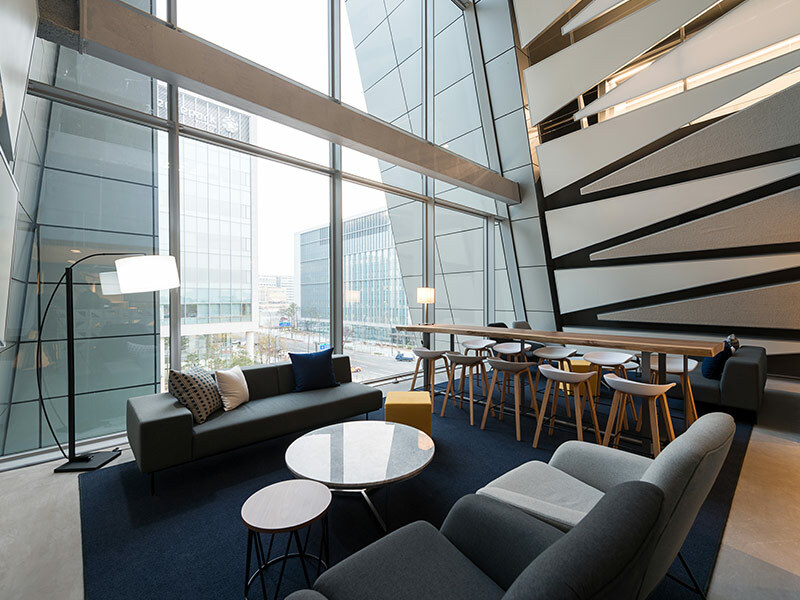 As seasoned design consultants and project managers, SL+A could create a welcoming and inspiring space for close to one thousand Kolon employees relocating to Gangseo-gu, Seoul. The new complex consists of three buildings: an eight-floor research center, an expansive ten-floor office building and the exciting new pilot building. 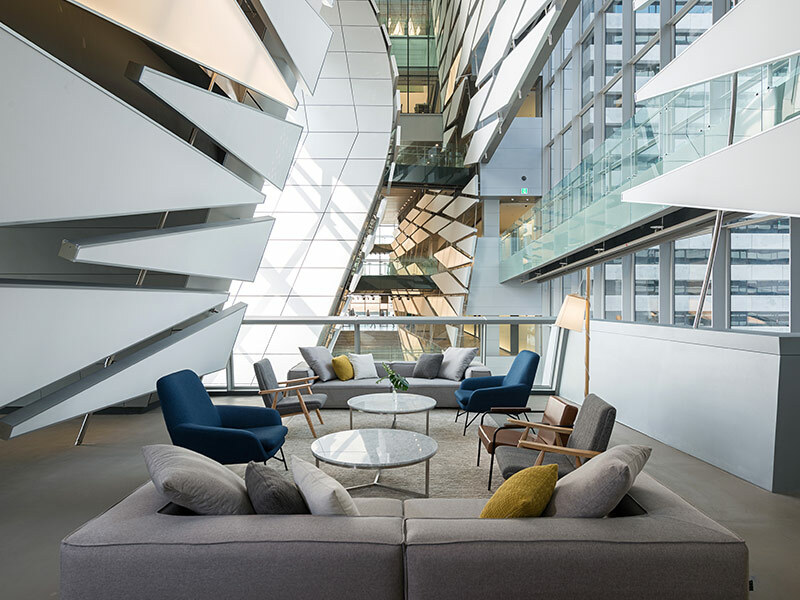 This new office tower was designed to be an innovative hub for research and development, to oversee support functions and overall operations. With 16,300 square meters of space, the One & Only Tower uses eco-friendly materials on both the exterior and interior of the building. The overall color scheme, modern finishes and consistent use of materials provides a sense of unity throughout the three buildings. Geometric white panels were used as an recurring internal design feature to evoke a sense of modernity and forward movement. The panels allow light to stream in throughout the offices, lounges and shared areas to create an interesting juxtaposed visual effect. One of the most important parts of the complex is the dedicated office space, which purposefully does not follow conventional straight-lined arrangement of desks and work spaces. The free-form scattering of the open office creates a natural curved circulation which allows employees easy access to co-workers for unhindered communications. Pods of 3, 4, and 6 desks create small teams that can maintain accountability and streamline efficiency to maximize the quality of work. As a testament to Kolon’s policy of valuing individuals for originality and hard-work, workstations situated near the windows are allocated for use by all employees, taking the place of traditional offices occupied by executives or team leaders. Fluidity in the arrangement of executive offices and meeting rooms is made possible with custom furnishings for each room. The purpose and function of the rooms can be altered by simply moving around the furniture. 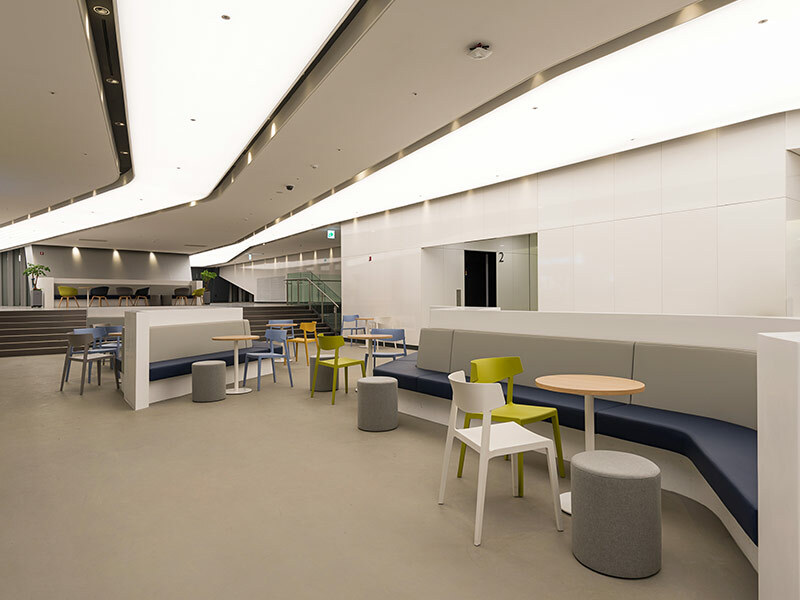 In addition, the ‘Open Collaboration’ zone, located on the opposite window side of the main workspace, serves not only as a relaxation area to unwind, but also functions as a cafeteria for less structured meetings that can take place in a casual setting. Spatial concepts were brought to life in the design of public meeting rooms, cafés, social hubs and presentation auditoriums. The end result truly provides a sense of creativity, freedom and vitality during work. With a varied background in different business industries including fashion, automotive, optical films, chemical manufacturing and bioscience research, Kolon Group continues to make significant contributions to the global community and hopes to push forward with new initiatives that can yield a better and brighter future.